The Great White Hunter and I are on a journey to try the new ‘Quality Bourbons & Barbecue in Mountain View California. 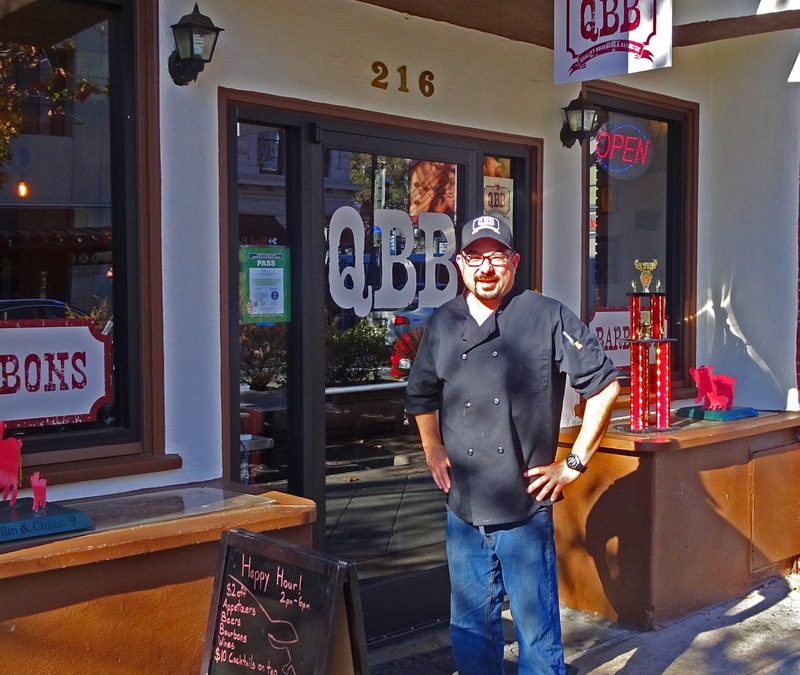 This new barbecue restaurant should be extra special because our bbq competitor friend Ryan Pang is the General Manager. Ryan is no stranger to championship bbq. He has won numerous trophies and also is a television personality. He made an appearance on Guys Grocery Games. Those of you not familiar with Mountain View it is a tony town that caters to the techies and nearby Stanford College. What this means is parking was horrendous. Parking karma was on hiatus. I am not sure if the Great White Hunter jinxed me or Mountain View is very popular at the noon hour. Let’s just say we got a work out walking to the restaurant. We finally arrived to a packed house. The dining area is fairly small and loud. We did grab one of the last remaining spots and settled in for a barbecue treat. We scoured the menu and noticed the extensive list of bourbons. Wow, over a hundred different varieties made this list a blur. We were here for the bbq. I asked the waiter if I could order a combination of meats and a side. They do sell the meats by the pound and we made up a list of what I wanted to try. This included ribs, brisket and house smoke pastrami. I also wanted to try the house made sausage which the Great White Hunter ordered. Even though the restaurant was packed our meal was delivered very promptly. We started out with an appetizer of bacon wrapped jalapenos stuffed with cream cheese and the house made sausage. It is served with the house made barbecue sauce. This appetizer was a great start. The heat of the jalapeno was tamed by the rich cream cheese with the added bonus of smoky bacon. The house sauce was tomato based with a hint of smoke. It was a very nice compliment to this rich, smoky, spicy treat. The rest of our meal came liquidity split. Our small table was full of food. Ryan included samples of all the side dishes with some home cured pickles. Let’s start out with the sides. The house made pickles made The Great White Hunter reminisce of his Aunt Flossies home cured pickles. I believe I saw a tear stream down his bbq sauce streaked face. They were fresh with a vinegar splash and still had a little crunch. 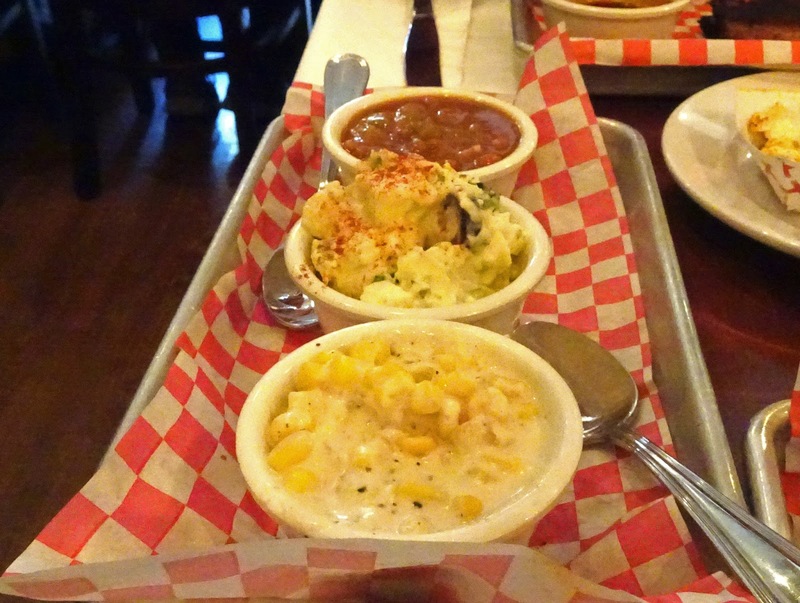 Creamed corn was decadent, Cole slaw was comforting, beans were hearty, and the potato salad was perfectly satisfying. The attention and finesse of the sides with a homemade touch showed the kitchen was paying attention and cared about quality. The sides fired on all the right cylinders. We shall proceed to the barbeque. The house smoke pastrami was my favorite. It was so very tender, kissed with smoke and just the right amount of salt. The ribs were dry rubbed with a fantastic mix of spices. They were fall off the bone good with a little bark from the spice rub. There was barbecue sauce served on the side but it was not needed. The brisket was an example of meat perfection. These prime packers were smoked by a championship competitor and it showed. This meat had all the right moves. Flavorful bark, tender and most of all beefy brisket flavor love. Oh my!!!!. The Great White Hunters house made sausage was made with pork and brisket trimmings. It was mild and full of porky goodness. Everything was so good. I am trying to find some fault with Quality Bourbons & Barbecue. The only fault I can honestly find is the parking. Ryan Pang has a vehicle to showcase his cooking genius. 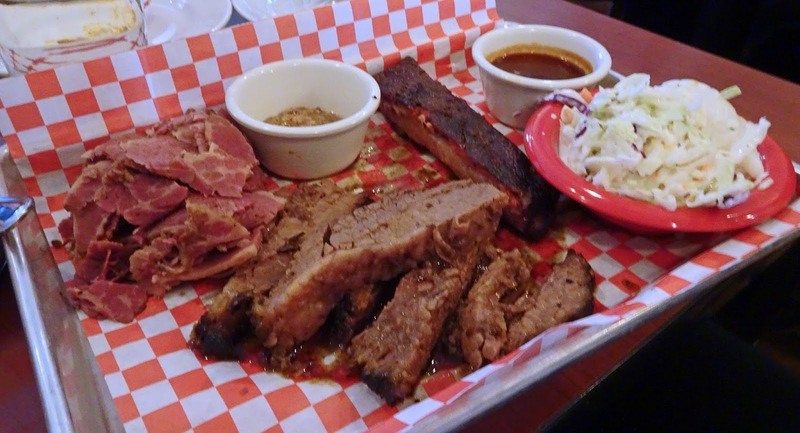 This restaurant can fill your bbq cravings and needs. If you have desire for bourbon they have you covered in this department too. I will return just for the pastrami it was that good. 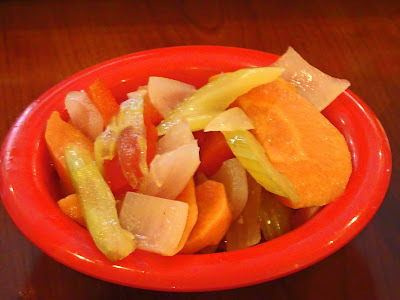 Ryans kitchen pays a lot of attention to detail evident by the sides and the wonderful pickles. The barbeque meats are better than competition which I am scoring very highly. What a wonderful bbq adventure. That is some high praise coming from a BBQ judge. Glad they were able to move their great food from the competition into higher volumes and wait times of a restaurant. Big Dude, We were very happy with all the bbq and sides. The pastrami was spectacular. If the Great White Hunter had not thrown off my parking Karma this lunch would have been perfect. Nice review Chilebrown!! Next time I'm over on that side of the bay (and not heading to a contest) I'll stop in. Scott Simpson, With Bay Area traffic it can be a challenge to make it to that side of the Bay but it is worth the trip. greatwhite hunter, You are weird. I could go for some jalapenos now, great looking place!